Researchers at Okayama University describe in Acta Biomaterialia a new type of biocompatible adhesive material. The adhesive, made from nanoparticles of hydroxyapatite, glues both synthetic hydrogels and mouse soft tissue, providing a promising alternative to organic materials currently in use for clinical applications. Dispersions containing hydroxyapatite (HAp) nanoparticles, dried and made into plates have outstanding adhesive properties, and are biocompatible and biodegradable. Experiments demonstrated the ability of the novel adhesive to glue various types of mouse soft tissue. As an alternative to surgical stitching with suture, the practice of using adhesive organic materials for joining soft tissue has been around for decades. However, the currently used clinical adhesives often suffer from limited biocompatibility and/or sub-optimal adhesive strength. A team of researchers led by Takuya Matsumoto from Okayama University and colleagues has now identified a class of biocompatible–biodegradable compounds showing promising adhesion properties when applied to mouse soft tissues. The scientists relied on the recent discovery that certain nanostructured materials display remarkable adhesiveness. For example, introducing a dispersion of silicon oxide nanoparticles between two hydrogels results in rapid adhesion of the hydrogels — an effect now developed further for industrial, non-clinical applications. In order to achieve the level of biocompatibility required for clinical usage, Matsumoto and colleagues experimented with nanoparticles of hydroxyapatite (HAp), an inorganic material found in human hard tissues such as bones and teeth. HAp-composites are routinely used for orthopedic and dental implants, as well as in tissue engineering. The researchers reckoned that dispersions of nanoparticulate HAp should behave as biocompatible adhesives — an idea they were able to confirm experimentally. Matsumoto and colleagues first examined the effect of HAp-nanoparticle dispersions on the adhesion of synthetic hydrogels; the presence of HAp clearly enhanced the level of adhesion. Drying the dispersions — resulting in solid HAp ‘plates’ — increased the cohesion between the HAp nanoparticles, and using the plates as the adhesive agent then led to even better inter-hydrogel adhesion. 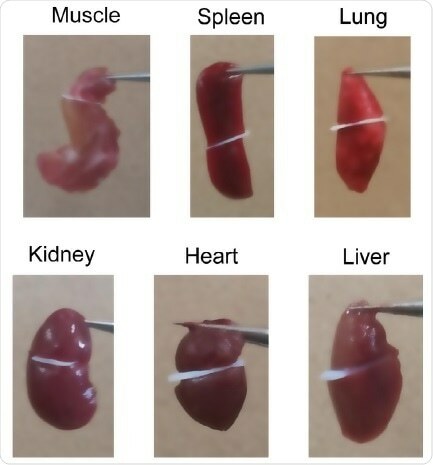 The scientists then tested the HAp plates on different mouse soft tissues: muscle, lung, kidney and other tissues could be successfully glued together. An adhesion strength at least twice as large as obtained with a commercial organic glue was observed for mouse skin tissues.